Eastern freshman Matthew Blanchard (left) flips to Isaiah Fish (45) at second base for a force out, during the Eagles’ 5-4 setback on Friday at Beavers Field in Lancaster, Ohio. Eastern senior Kaleb Honaker scoops the ball for an out at first base, during the Division IV Region 15 final on Friday in Lancaster, Ohio. LANCASTER, Ohio — An unfortunate conclusion to a magical season. 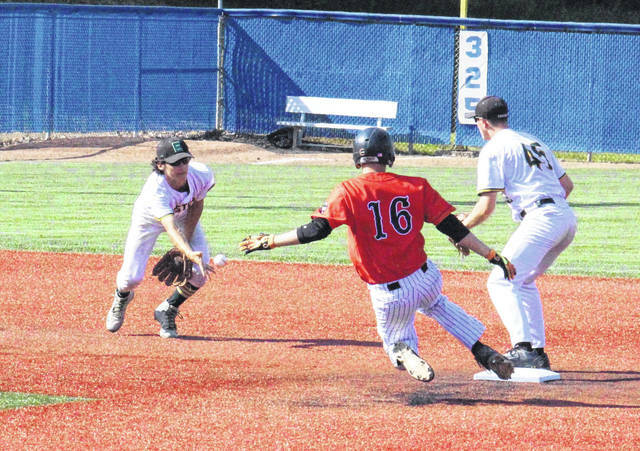 Eastern had its 2018 campaign come to a close in the Division IV Region 15 championship baseball game on Friday at Beavers Field in Fairfield County, as the Eagles fell short of No. 1 Mowrystown Whiteoak by a 5-4 tally. The Eagles (27-3) — who have the most wins by an EHS baseball team in over 30 years — brought a 14-game winning streak into their first-ever Elite Eight contest, having not lost in 37 days. Following Friday’s championship showdown, Eagles head coach Brian Bowen — who heads into the offseason with a 277-156 record after completing 18 seasons at the helm — talked about the special year that his club had. 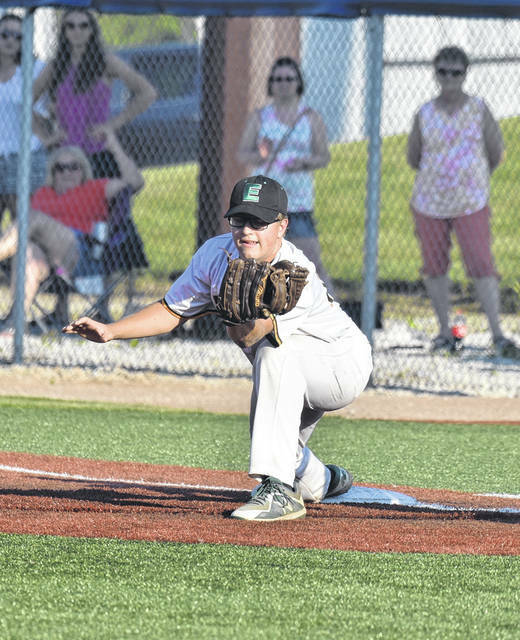 The Eagles — who only surrendered four runs in a game five times prior to Friday — gave up four runs in the top of the first inning to Whiteoak (28-2). Traeten Hamilton reached on an error to lead off the game, and then scored on the second of back-to-back singles by Chase Carraher and Caleb West. Mason Lehr hit a two-run double with one out in the frame, and then he scored on a two-out single by Casey Nace. In Eastern’s first chance at the plate, Christian Mattox hit an infield single, but wound up being stranded on third after three straight outs. Whiteoak was held hitless in the second, and Eastern began chipping away at its deficit in the home half of the frame, as Owen Arix doubled home Nate Durst. The Wildcats left a runner on second base after a two-out double in the top of the third, and Eastern took another run off the margin in the bottom of the third, as Ethen Richmond singled home Mattox. WHS got that run back in the top of the fourth inning, however, as Ryan Roberts — batting at the bottom of the order — drew a two-out walk and then scored on a single by Hamilton. Eastern was sent down in order in the bottom of the fourth, but returned the favor and retired the Wildcats in order in the top of the fifth. A pair of two-out walks ultimately left two Eagles on base in the bottom of the fifth, but Whiteoak couldn’t add to its lead following a two-out single in the top of the sixth. A lead off walk, a one-out hit batter, and a two-out walk loaded the bases in the bottom of the sixth, but a flyout to stranded all three Eagles. Back-to-back two-out singles, followed by an intentional walk to Lehr, loaded the bases full of Wildcats in the top of the seventh, but a groundout to third ended the frame. Austin Coleman led off the bottom of the seventh with a single for the Eagles, and Richmond followed with a double, putting two runners in scoring position. The first out of the frame let Coleman score, as Kaleb Hill hit a sac-fly to right. Durst was issued a free pass with one out in the frame, and then Richmond scored on a wild pitch in the following at-bat. Durst — the potential game-tying run — made it to second base on the play, but a line-out and a strikeout stranded him there, and gave Whiteoak the 5-4 victory. Mattox took the pitching loss for the Eagles, striking out two batters and allowing four runs on four hits in one inning of work. Coleman pitched the final six frames for Eastern, surrendering one run on five hits and two walks, while striking out seven batters. WHS junior Chase Butler was the winning pitcher of record in 4.2 innings, striking out four, while giving up two runs on four hits, four walks and a hit batter. Hamilton pitched .2 innings in relief, striking out a batter, walking one and hitting one, while Trever Yeager earned the save, giving up two runs on two hits and two walks, while striking out two. Richmond led the Eagle offense, going 2-for-3 with a double, a run scored and a run batted in. Arix had a double and an RBI, Coleman and Mattox both singled once and scored once, while Josh Brewer hit a single, Durst scored a run, and Hill picked up an RBI. Lehr led the Wildcats with a 2-for-3 day that included two doubles, a run scored and two runs batted in. West was 2-for-4 with a run and an RBI, Hamilton singled once, scored once and drove in one run, Carraher singled once and scored once, while Nace had a single and an RBI. Butler and Evan Brill also singled for WHS, while Roberts scored once. The Eagles were responsible for three of the game’s four errors. Eastern left nine runners on base, five of which were in scoring position. Whiteoak left six runners on base, including four in scoring position. Friday also served as revenge for the Wildcats, who fell to Eastern by a 5-3 count on April 27 at VA Memorial Stadium in Chillicothe. The Wildcats — champions of the Southern Hills Athletic League Division II — become the first Southeast District team to reach the Division IV state tournament since 1992, when Portsmouth Notre Dame made the Final Four. The top-ranked team in the Ohio High School Baseball Coaches Association Division IV poll, Whiteoak will face No. 9 Hicksville at 1 p.m. on Thursday in the state semifinal at Huntington Park in Columbus. Friday was the final game in the Green, White and Gold for Eagle seniors Owen Arix, Josh Brewer, Tysen Casto, Brandon Colburn, Austin Coleman, Kaleb Hill, Kaleb Honaker, Christian Mattox, Isaac Nottingham, Ethen Richmond and Matthew Werry. “The seniors that played for so long, I’ve seen them grow so much,” Bowen said. “I feel confident, with them graduating and moving on with their futures, that they have a blueprint and a plan for success. I’m excited to see what they’re going to go do. In the last four seasons, Eastern has gone a combined 74-28, winning over 62 percent of its games each year, with a winning percentage on 90 this spring. Along with the seniors who have been mainstays in the lineup throughout their careers, Bowen also spoke highly of the EHS seniors who held different roles with the team. Eastern’s memorable season featured a Tri-Valley Conference Hocking Division championship with a 15-1 league record, the school’s 21st sectional title, and the 11th district crown in program history. The five runs allowed on Friday are the third most EHS has allowed in a game this season, with the Eagles shutting out 11 opponents this spring.